HpE Process is your most knowledgeable supplier delivering the right product matched to the process. We have been a major stock holder of stainless steel hygienic tube and fittings for over 25 years, in that time we have always maintained strict standards on these products, meeting or exceeding national and international standards. Our products combine high-quality materials, manufactured by state of the art technologies and certified processes. 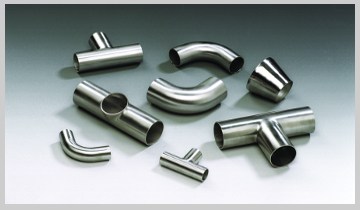 The tubing we supply is true process tube, not exhaust or architectural grade that has been polished up. HpE offer an unsurpassed level of advice and high quality products in sectors as diverse as household, food and personal care that has enabled manufacturers to install effective systems that deliver uninterrupted production. As down time is cut, waste is minimised and the investment is quickly repaid within a shorter than expected period of time, delivering commercially viable results. We hold and supply a full range of hygienic fittings to BS4825 including, 90ᴼ bends, 45ᴼ bends, pulled equal tees, branch equal tees, concentric & eccentric reducers, RJT & Tri Clamp Unions and clips. Various parts from RJT 1” to 4”, SMS, 3A, DIN 11864, DIN11851 and suit to metric or imperial tube. For more information you can contact our technical team. HpE stock a range of bends with matched radaii to allow fabrication of jackets bends. We also stock laser cut closure plates for sealing line ends, BSP fittings, vents for water connections to the jacket and a full range of de-mountable fittings for use with press-fit pipe-systems. We supply angle pattern, Y type or in-line options, with elements in perforated tube, woven mesh, or wedge wire construction. Filters with bag or cartridge elements.